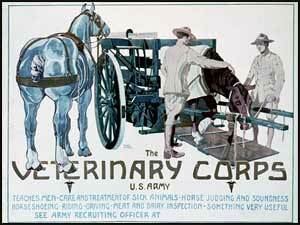 Caring for horses has come a long way! World War I poster in the Library of Congress. Alternative Therapies: Good for You, Great for Your Horse! There is little doubt that alternative therapies are on-trend and what these can do for human health has also opened up a wealth of possibilities and opportunities to provide equine alternative therapies in the form of acupuncture, Rolfing, herbal remedies and homeopathic solutions, amongst an ever-widening range of options. Here is a look at some of the alternative therapies that you may want to consider for your horse and remember to take proper veterinary advice, especially when you consider that many of these treatments are designed to complement veterinary care rather than replace it entirely. The Chinese have been practicing acupuncture on humans and horses for thousands of years and the premise is that by stimulating specific points on the body, you can generate beneficial effects by tapping into the currents of energy that flow through the body pathways that are called meridians. The conventional Western view of this alternative therapy is that acupuncture stimulates the nervous system and causes the release of body chemicals including endorphins, which help to ease pain, improve circulation and promote the reduction of muscle spasms. It should always be remembered that if your horse is sick or badly injured then your medical priority is to seek veterinary help first and foremost, but treatment using acupuncture may well produce some noticeable improvements in the recovery process and ease the level of pain being felt. Look to see if there is a noticeable improvement in the horse’s condition after about four sessions of acupuncture and review your position at this point to see whether you want to continue with this particular alternative therapy or look at other options if you are not noticing any benefits. If you are not familiar with Rolfing, it can also be referred to as structural integration and is in many ways, a fusion of massage and chiropractic methods which is performed by a certified Rolfer and licensed equine massage therapist. The process involves manual manipulation of soft tissue with the aim of seeking to rebalance the horse’s structure, working with the tissues that pull on bones and joints, which is where the focus is different from a Chiropractic approach. Rolfing was a method developed for people about 50 years ago and works on the theory that the body compensates for tension and injuries in a way that pulls the natural physical structure out of line, and using various parts of their hand and even their elbows, the Rolfer aims to free the connective tissue and allow the body to align. You can actually see physical signs of the horse responding to this treatment as they may chew, yawn, shake their head or jiggle around during the session, which are all positive signs of tension release. Between three and five sessions of Rolfing should be sufficient in order to address most issues and if you are unsure, perhaps ask the practitioner whether you can watch a session before booking treatment for your horse. The key to using alternative medicine in addition to things like Natural Horse Supplements is to consider the health of the animal in its entirety rather than focusing attention on one specific area such as an injured limb. Alternative medicine is a wide-ranging term that describes holistic practices that rely on medications and the use of syringes and will involve treatments using chiropractic methods, acupuncture, herbalism and homeopathy amongst various different modes of treatment. A common issue with horses is lameness and this condition is a good example of how alternative medicine can be used to help the animal back to a full recovery in a more natural way. There are many different facets of lameness and it can often have a domino effect in triggering other ailments as a result of the original problem causing pain and discomfort. For example, if a horse is found to have arthritis in the hock, this will cause a change in movement that then becomes muscle soreness in the lower back, which in turn can cause the horse to shift its weight unnaturally which will further compound the injuries that they are suffering from. Many of the horse owners and practitioners who advocate the use of alternative medicine and view a holistic approach to healing in a positive way, also understand and adopt the principle that conventional medicine or alternative medicine could fix the problem eventually on their own, but when the two forces are combined, this makes for a potentially powerful force that can help your horse quickly and efficiently return to full health. Contributing author Misty Easley is a highly experienced veterinarian. When not treating her patients, she spends her time researching emerging research and trends in the vet medicine.